1. Halve the lemon lengthways, set ½ aside and finely slice the rest into half-moons. 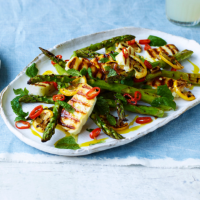 Toss the halloumi and lemon slices with ½ tbsp oil; set aside. 2. Put a griddle or frying pan over a high heat. Toss the asparagus with ½ tbsp oil, season and spread out in a single layer. Cook for 5-6 minutes in total, turning occasionally, until charred and just tender. Transfer the asparagus to a serving platter and keep warm. 3. Griddle the halloumi and lemon slices, in batches if needed, for 1-2 minutes on each side, until charred. (Keep an eye on the lemon slices, as they can burn easily.) Add the charred cheese and lemon to the asparagus platter and scatter over the chilli and mint. Squeeze over the reserved lemon ½, drizzle with the remaining 1 tbsp olive oil and season. Serve immediately.